President Bush, Vice President Cheney and prominent GOP governors are all skipping the Republican National Convention, and the party is considering shortening its big four-day event as Hurricane Gustav approaches the Gulf Coast with potentially deadly strength. The convention, a marquee event meant to send presidential candidate John McCain into the fall campaign with a burst of energy and good feeling, already was becoming overwhelmed by alarming news of the hurricane just three years after deadly Katrina struck New Orleans. On Sunday, GOP officials were in round-the-clock meetings and tracking the path of the storm, trying to determine how to complete the official business of nominating McCain while also being sensitive to the thousands of people fleeing the Gulf Coast - more than 1,000 miles down the Mississippi from St. Paul. The Bush White House and Republicans in general are still shadowed by criticism of their handling of relief efforts after Katrina, which devastated New Orleans and parts of the Mississippi Gulf Coast three years ago. Party leaders fear that televised scenes of celebrations and partying at the convention could subject them to similar criticism now. Cancellations by major speakers came as Republicans scrambled to change the tone - and perhaps the length - of their national convention, even as delegates streamed into town. McCain, the Republicans' nominee-in-waiting, tore up his campaign schedule to visit Jackson, Miss., with his running mate, Sarah Palin, to get briefings on the approaching storm. He was invited by Mississippi Gov. Haley Barbour. 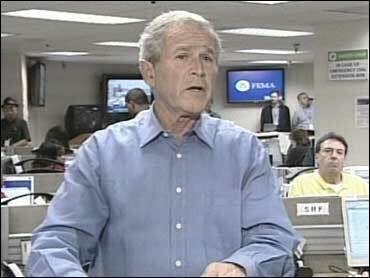 Bush and Cheney, both of whom were to have spoken Monday night, weren't coming, the White House said Sunday, citing the hurricane. California Gov. Arnold Schwarzenegger backed out in an unrelated budget dispute with California legislators. All three were to address the convention on Monday, its opening day. "Senator McCain has already indicated that it would be inappropriate to have celebrations, that things have to be scaled back," Giuliani told CBS News' "Face the Nation." "It just wouldn't be appropriate to have a festive occasion while a near tragedy or a terrible challenge is presented in the form of a natural disaster," McCain said. Still, he said, "I think that we are far, far better prepared than we were the last time." McCain headed to Mississippi as convention officials, GOP Chairman Mike Duncan, and McCain Campaign Manager Rick Davis were in intensive meetings to determine what to do about the convention. Republicans with knowledge of the deliberations said shortening their four-day national convention - and packing necessary work into a couple of days - was one of several options. Several officials said various possibilities were being considered - including adding more public-service elements, and trimming back the pep-rally segments. Canceling the convention altogether seemed highly unlikely, given that the party has to take formal steps to make sure McCain is nominated and can get on the ballot. But the convention certainly won't be as celebratory as planned. Democrats, too, were paring back their activities in St. Paul. Party spokesman Brad Woodhouse said the Democrats had canceled a "More of the Same" rally that had been slated for Monday. He said the tone of the Democratic rapid response effort would depend on the changes Republicans make in their convention program. Meanwhile, Democratic presidential nominee Barack Obama and running mate Joe Biden campaigned in Ohio and Michigan. Obama has said he is considering whether to visit the Gulf region but that such a trip with the accompanying media "can be a distraction in these kinds of situations." The Republican candidate's wife, Cindy McCain, said her husband's choice of Palin, a first-term Alaska governor little known outside her home state, was "a marvelous choice." "They're a perfect match," she told ABC's "This Week" in a taped interview. Why? "Because she's a reformer. And she thinks outside the box, the way my husband does," Cindy McCain said. "You know, Washington is just a quagmire. It's a mess right now. And both of them have been serious reformers." As to Palin's lack of national security experience, Cindy McCain said, "Alaska is the closest part of our continent to Russia. So, it's not as if she doesn't understand what's at stake here. It's also about making decisions and be targeted in what she thinks. She has a great mind. And she has a very serious direction in where she goes." Also defending McCain's running mate choice was Minnesota Gov. Tim Pawlenty, passed over by McCain for the No. 2 spot. He called Palin "a maverick with a record of reform."